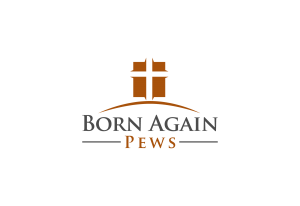 It has been a busy summer here at Born Again Pews. We are ending the summer pew run just as we started it, busy. We have been burning up the highways, criss-crossing the country. The end of July found us close to home. We were 230 miles from home in Watonga, OK at the Blaine County Courthouse. Cynthia Scheffler was there to greet us, excited about the benches they were receiving. We were excited to be a part of the remodel of this courthouse that was built in 1906. It is always a privilege to be part of something as historic as this building. Next up, we headed south to Wichita Falls, TX and Allendale Baptist Church. There we met Warren Hall, the pastor of the church. As we were pulling up, Pastor Hall and one of his members were outside cutting down their old pews. 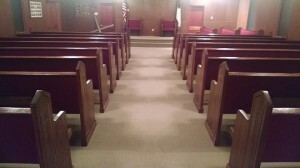 They were turning the long pews to short ones and selling them to individuals. 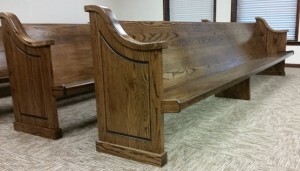 This is a great idea to get rid of the old church pews that you have. All it takes is just basic carpentry skills. We installed the #4003 Cantilevered church pews in their church with golden oak stain and Shire Steel Blue fabric. After leaving Texas, we had just a short break in our Summer Pew Tour. The next load could not be delivered by our installation crew. We packed up a container with new pews and shipped them to Boatswain Bay Presbyterian Church in the Grand Cayman Islands. They went with a more traditional pew, the #2005. As we closed the container, I had to check for stowaways. There were plenty of people that would have liked to made it to the Islands. Our next destination on our “End of Summer Pew Tour” took us to the East Coast. To bad there was not enough time to play in the ocean for a few days. 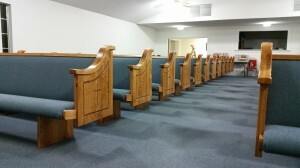 There was a church in Roanoke Rapids, NC that was patiently awaiting their new church furniture. The Church of Jesus Christ was our stopping point. We worked with Kenny Heaton of Heaton Construction on this remodel. A great group of people to work with. They went with the #3003 Cantilevered Colonial white pews. The back was all solid oak, no padding, stained in Minwax Early American stain. The seat was upholstered in Shire Koala material. 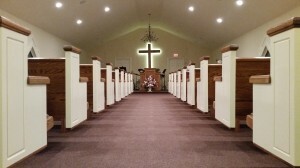 The folks at the church were very happy to be wrapping up a project that they had been working so hard on. After the long journey to North Carolina, we were happy to stay close to home for a couple of jobs. The end of August found us in Tushkahoma, OK at the Choctaw Indian Nation Chapel. This was a new chapel that the Choctaw tribe built for use by their tribal members. A beautiful chapel amongst the mountains in southern Oklahoma. Their choice of pew was the #3002 Full end. They used a Minwax Red Mahogany and Sherpa Mahogany fabric. The book rack side of the pew was oak veneer. The stone work on this chapel really set off the darker pews. I pray for many blessings to those who are married in this chapel in the future. Our final stop before the Labor Day Weekend was Fairy Baptist Church in Fairy, TX. This was a church that was originally built in 1883. They are still having church in the same building today. Fairy was a nice little community just outside Glen Rose, TX. It was a pleasure meeting Pastor Bob and his wife, and David and Vicky Black. It is always nice to put a face to the voices we talk to on the phone all the time. 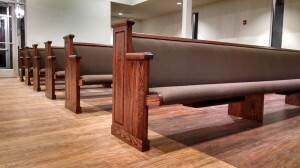 Their church went with the traditional #2005 end also in the red mahogany stain and Shire Red Rose fabric. As we round out this end of summer pew tour, we want to pray that God keeps blessing these churches as they do what they can to win souls for His Kingdom. It has been a lot of work and thousands of miles these past few weeks, but we have lots more to go. We are off to Pennsylvania next. So if you have a chance, say a prayer for us. Be sure to like us on Facebook to keep up with our travels. Thank you and God Bless.